The surreal biomechanical world of Inner Chains is revealed with the first gameplay trailer. Telepaths Tree has just launched a Kickstarter campaign, seeking $10,000 to help finish its horror FPS game. You can also vote for it on Steam Greenlight. 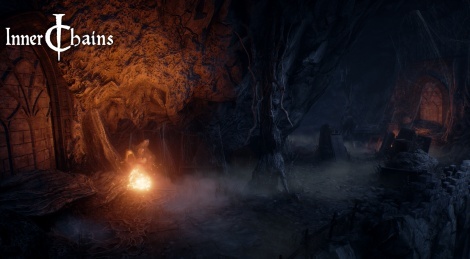 Get a look at this dark, Unreal Engine 4-powered world with the trailer and screens inside. "Our plans regarding Inner Chains’ scale were less ambitious when we first started working on the project than they are now. But then the game announcement went live and the amount of positive feedback we got motivated us massively and gave us an additional boost. It was then that we decided to focus entirely on this project, put everything else aside, and create an absolutely unique game that would stand out from other similar titles. Our main goal will allow us to polish some new, additional in-game elements that will make Inner Chains a truly outstanding experience. Of course we also have some aces up our sleeves and some of them were listed as our stretch goals" – says Tomasz Strzałkowski, CEO of Telepaths’ Tree. • Unprecedented methods of interaction between weapons, their users, and the environment. • A dark biomechanical world where both fauna and flora lie in wait for your slightest stumble. • Stunning surreal visual style. • Deadly, intelligent, and challenging opponents. • Unusual locations with their own unique stories. • A dense, suggestive atmosphere of terror, magnified by the great soundtrack composed by Michał Staczkun. • Subtle thriller elements that will fill you with fear in unusual, inventive ways. • Thrilling action combined with an interesting, hair-raising story. To follow the development of the game, visit Inner Chains’ official website: <92ca>http://innerchainsgame.com/, and the Facebook and Twitter profiles. Is this the game that was supposed to have 'Euphoria' engine type physics based animation? Wow it's atmosphere reminds me of Quake and dark souls. I hope for a console port if it does well. Combat looks weak I mean gunplay - clanky&clumpy. Cool visuals, but weak gameplay. These guys have got a long way to go. Hope they get the money they need.